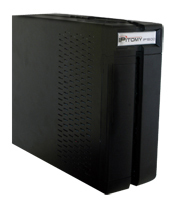 The IPitomy 1500 is a powerful business communications platform. It is a pure IP PBX designed to use IP networks for voice calls. Engineered to support from 10 to 500 users, the system will work with analog lines and T1 /PRI lines for traditional Public Switched Telephone Network (PSTN) connectivity. In addition to traditional telephone lines, the IPitomy 1500 can use VoIP service providers like IPitomy Exchange, replacing traditional PSTN lines with a broadband connection. IP1500 handles all of your communications requirements in the office. The IP 1500 can be configured in any way that best suits your telecommunications needs. Easy connection to VoIP over your existing data connection or the IPitomy IP1500 can be linked up to the IP400 for easy connection to PSTN lines. Also available is a on board PSTN card that can handle up to twenty-four lines. If you network requires a fast moving T1 line, we have it. Add - on T1 cards can support standard T1 technology and also PRI’s. The Ipitomy1500 can also support dual port T1 cards. With this state of the art system the possibilities are endless. Whatever the situation maybe with the purchase of an IPitomy IP1500 you will be covered.